Here's a novel way of recycling your old engine oil. 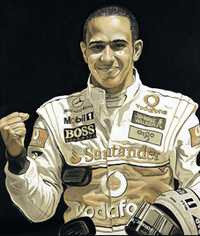 New York artist David Macaluso painted this portrait of Lewis Hamilton, using Mobil 1 oil from the Formula One champion's winning McLaren Mercedes MP4-23 engine. And a nice job too: crisp, clean and recognizable. Mobil 1 is giving away a limited edition of 50 prints of this painting to promote National Oil Check Week, which starts Monday 15 June. A worthy cause. It could save your engine. Click the title link to find out how to enter the competition.